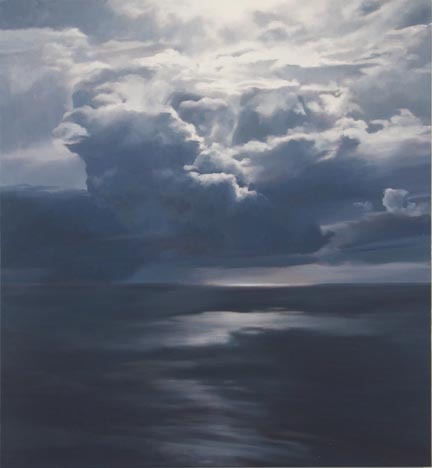 Barbara Edwards Contemporary is pleased to present a solo exhibition of prominent American artist, April Gornik. Renowned for her re-invention of landscape painting, Gornik seeks an "intimate immensity" in her work, creating palpable tension between observed reality and the sensual imagined. "There's something ominous in beauty," Gornik explains. This sense of apprehension fixes us psychologically in her landscape - as though if one looked away, all could change in an instant. Gornik came to landscape painting intuitively at a time that was rooted in minimalism and the conceptual avant-garde. While this had an impact on her development, she sought to create something that derives its power from being vulnerable to interpretation, "that is intuitive, that is beautiful." Born in Cleveland, Ohio, Gornik completed her BFA at the Nova Scotia College of Art and Design in 1976 and currently works and lives in New York City. She has had numerous solo exhibitions throughout the United States including the Edward Thorp Gallery, Danese, Mary Ryan Gallery, New York, NY; Institute of Contemporary Art, Boston, MA; The New Gallery of Contemporary Art, Cleveland, OH; and internationally at The Sable-Castelli Gallery, Toronto, Canada; and Galerie Springer, Berlin, Germany. Her work is in the permanent collections of the Metropolitan Museum of Art, the Museum of Modern Art and the Whitney Museum of American Art in New York, and the Smithsonian American Art Museum among others.